Arctic News: Is the permafrost's integrity breaking down? Is the permafrost's integrity breaking down? 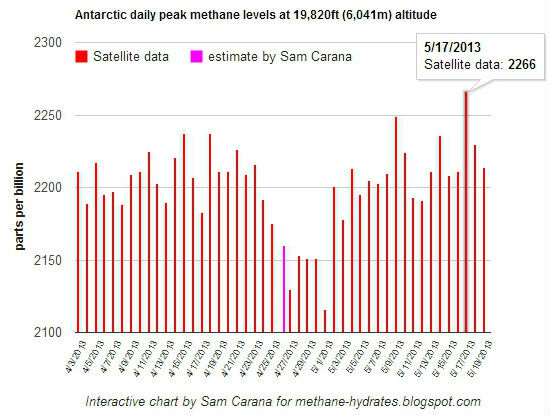 The chart below shows very high methane levels over Antarctica in April and May 2013. High levels of methane over Antarctica were recorded before in 2013, as described in an earlier post at the methane-hydrates blog. 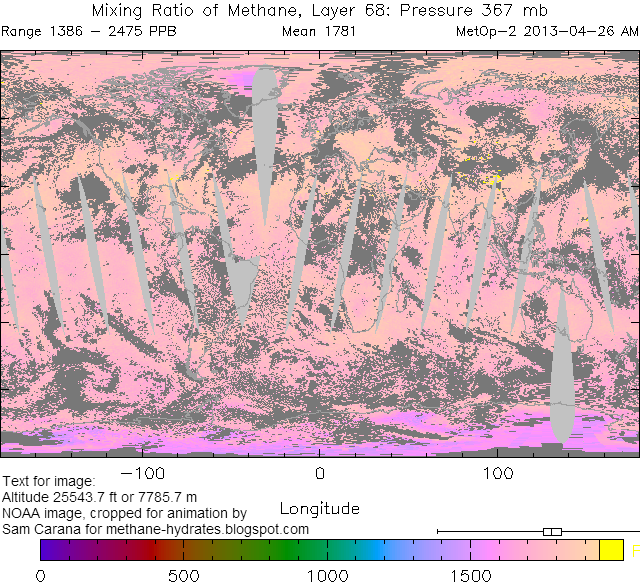 Meanwhile, a methane reading of 2475 ppb was recorded on April 26, 2013, appearing to originate from the Himalayan Plateau, as illustrated by the image below. Recurring high readings could indicate that methane is bubbling up through the permafrost, both in Antarctica and on the Himalayan Plateau. 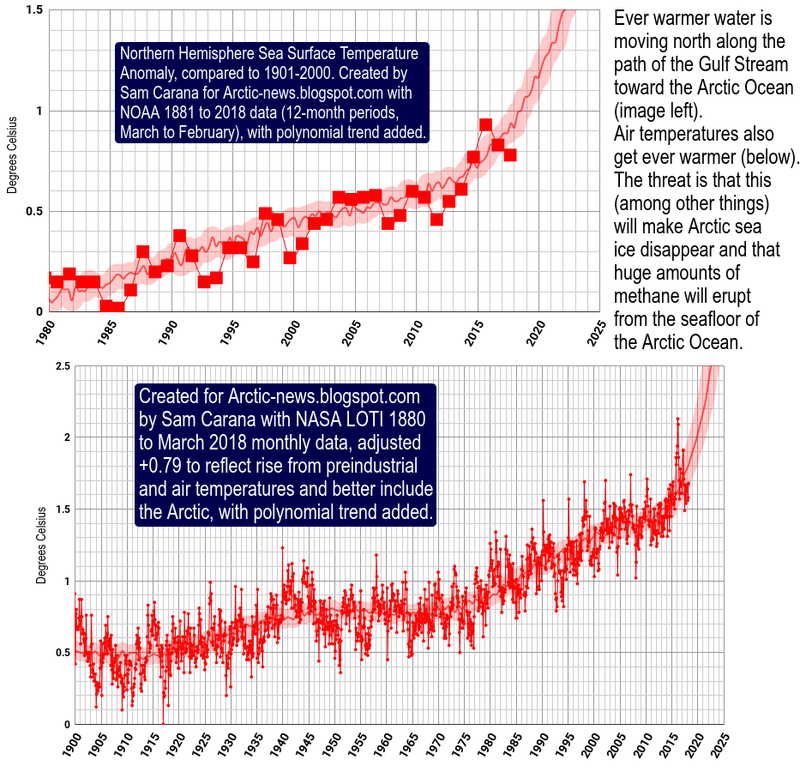 Loss of the integrity of the permafrost is particularly threatening in the Arctic, where the sea ice looks set to disappear within years, resulting in huge albedo changes in summer. Decrease of surface reflectivity results in increases in absorption of energy from sunlight and decreases in shortwave radiation in the atmosphere. The latter results in lower photo-dissociation rates of tropospheric gases. Photo-dissociation of the ozone molecule is the major process that leads to the production of OH (hydroxyl radical), the main oxidizing (i.e., cleansing) gas species in the troposphere. A 2009 NASA study projects this to lead to a decrease in OH concentrations and a weakening of the oxidizing capacity of the Arctic troposphere, further increasing the vulnerability of the Arctic to warming in case of additional methane releases. 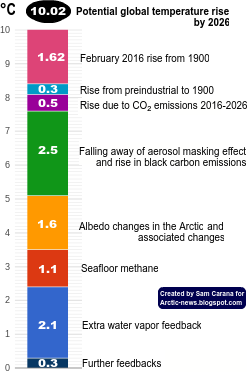 Levels of greenhouse gases such as carbon dioxide and methane are already very high in the Arctic atmosphere, while large quantities of black carbon get deposited on snow and ice, further contributing to the albedo changes. This threatens to result in rapid summer warming of many parts of the Arctic Ocean with very shallow waters. Additionally, rivers can bring increasingly warm water into those shallow seas in summer, adding to the threat that heat will penetrate the seabed that contains huge quantities of methane. 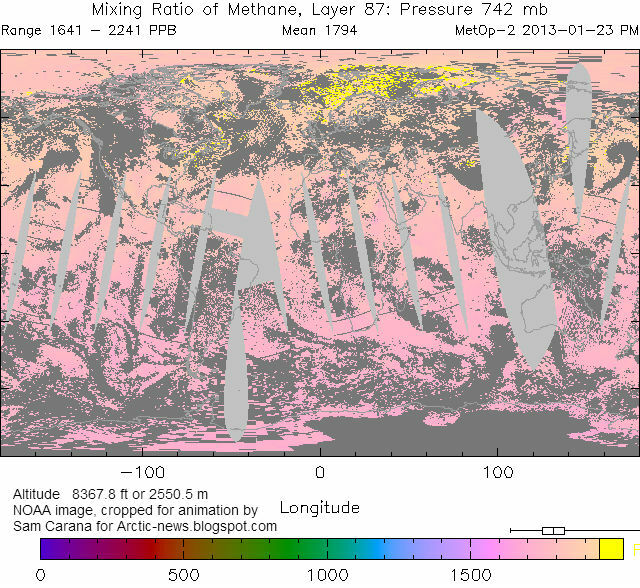 Above image, earlier included in an animation at the Arctic-news blog, shows methane concentrations on January 23, 2013, when a reading of 2241 ppb was recorded in the Arctic. Analysis of sediment cores collected in 2009 from under ice-covered Lake El'gygytgyn in the northeast Russian Arctic suggest that, last time the level of carbon dioxide in the atmosphere was about as high as it is today (roughly 3.5 to 2 million years ago), regional precipitation was three times higher and summer temperatures were about 15 to 16 degrees Celsius (59 to 61 degrees Fahrenheit), or about 8 degrees Celsius (14.4 degrees Fahrenheit) warmer than today. As temperatures rose back in history, it is likely that a lot of methane will have vented from hydrates in the Arctic, yet without causing runaway warming. Why not? The rise in temperature then is likely to have taken place slowly over many years. While on occasion this may have caused large abrupt releases of methane, the additional methane from such releases could each time be broken down within decades, also because global methane levels in the atmosphere were much lower than today. In conclusion, the situation today is much more threatening, particularly in the East Siberian Arctic Shelf (ESAS), as further described in the earlier post methane hydrates. Above post is an extract of the full post at the methane-hydrates blog. The permafrost and ice appear to be leaking methane like a sieve. It is amazing how methane can get through the frozen ice and permafrost. They are not solid. The permafrost and ice do not have to completely melt to release methane. So much for the permafrost and ice safety zone cap over the methane below. I was shocked when the Antarctic methane readings were as high as the Arctic. Plans to re-freeze the Arctic may not stop the methane from coming up. Dr. Katey Walter noticed years ago that when the top layers of permafrost re-froze in the fall and winter, methane emissions increased. If further warming decreases the integrity of the ice and permafrost, the speed of the methane escaping will probably increase. The speed of this process is critical. Yes, the way methane emissions surge is seen above decaying methane hydrate it looks likely it's partly due to pressure increase when cap of water ice or something else tries to interrupt the escape of gasses to the atmosphere from decay which has reached stability zone. Effectively the way levels are up in atmosphere in the North, South and now over Himalayan Plateau -Yikes. What fascinates me is the audacity of hope that US is invincible and that Earth will survive. That somehow science will come to the rescue, as even at the same time funding for science is undercut and media is given over more and more into the hands of Big Media worldwide and to corporate consolidation.. The little guys who would, could and are trying to make rally happen -no on the whole coverage and a decaying satellite system for Earth science. Thanks to all the people who contribute to and run the Arctic News. I am in awe of you all. What if we could cover these vulnerable shallow-depth arctic areas with a white tarp, with a vent that expels and flares the methane that is accumulating beneath. I know that there really aren't any good solutions, but I can't just give up! When will anyone in power think this through and act intelligently? I think we will all be doomed by their greed and our unwillingness to dislodge them from power. We need a public willing to sacrifice everything in order to save the future. I worry that the news that will galvanize us to make this sacrifice will be that it is too late to stop the runaway effects from wiping us all out. Sad story those humans. Such potential so sadly wasted. Good thinking, Robert, a white tarp can both reflect sunlight back into space and capture methane. We should keep looking for the best ways to reduce the dangers. One person who has done a lot of work on this is prof. Salter, see http://arctic-news.blogspot.com/p/methane-capture.html. Today US President will lay out plan to work on 'Doing what he can' to stop heat rise -it's 25th June, four and one half years since he came into office. "Yes we can' has become do-what-we-can in spite of deniers in Congress and elsewhere while working around the edges fiddling, trivially; I say trivially because taking all things now into consideration, we are now locked,, literally locked into a system of resource extraction and ecosystem destruction behavioral pattern dictated by the likes of money, money not tied to full accounting of the harms to Nature and stuff like aggression or entropy rise inflicted in the process of expansion." This is all or nothing now. we either stop methane release and reverse concentration in atmosphere or lose HZ effective radiance level of solar uptake and spike to extinction line, I worked as a framer of houses and took up learning things in an effort to frame a way to try and keep Earth alive, That included study of physics and industrial technology at college along with a personal emphasis on statistics and communications. And work now to frame a new constitution for world finance to unleash the full potential Max in trying to give frame to work to support hope and undo destabilization of earth's ecosystem. And through hope make Real ,comment changing the subject to Frame a open system of finance in sync with the health of Nature's ecosystems that sustain life and keep Earth Habitable. The track for change better cover root core alteration of what holds us back.